Xplenty can access your database or file server, allowing you to read and write data easily, regardless of their whereabouts - on the cloud, hosted or on premise. Allow Xplenty direct access to your server by opening a firewall rule. Create a reverse SSH tunnel from your network to Xplenty's network. Allow access to your server's host and port from Xplenty's IP addresses. Create a user and grant it minimum permissions required for Xplenty to read or write data from the server. Add a public key in your user settings. The public key will be propogated to all Xplenty servers in up to 30 minutes. 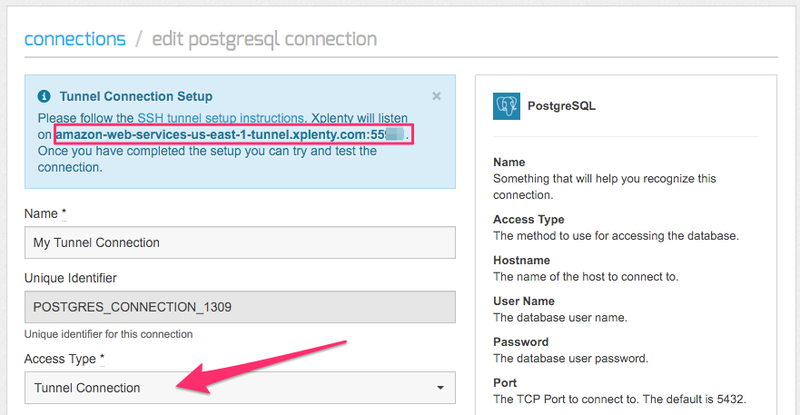 Create a “Tunnel connection” in Xplenty with and retrieve Xplenty’s tunnel server (Xplenty server) and connection port. For other Linux distributions, follow the instructions here.